The Literacy Gazebo provides a great place for children to sit and listen to stories, tell stories to other children, or create their own stories using art supplies. Include books about plants, insects, birds, gardening, etc. to promote outdoor literacy for preschoolers on your natural preschool playground. 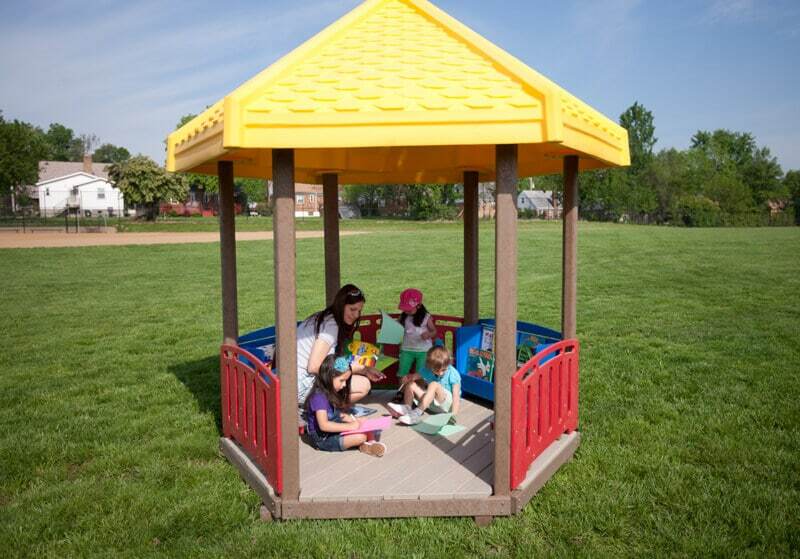 The floor of this outdoor learning center equipment is a platform that can be used for reading, writing, and drawing. The roof provides shade and cover in light rain. This area includes (2) lockable bookcases and (3) benches. The sixth side of the area is open for entering and exiting the area. Each bookcase has (4) different shelves for displaying materials. One of the bookcases is designed to hold art supplies such as paper and markers so children can draw and tell their stories; the second one is designed to hold books. The benches can be used to sit on or for children to put their legs under and write on as a table. There are clear tops on the benches to provide additional discovery by placing objects under the bench so children can trace or draw the object found on the children’s outdoor playground. We recommend changing out the books and paper once a week because the humidity will damage these items, even if there is no rain during the week. Locks for the bookcases are not included.